Prophylaxe... ein Leben lang Marx, Robert E.
This exciting new book expertly describes key features of vertical and horizontal ridge augmentation, containing chapters on: the surgical anatomy of the floor of the mouth; the steps involved in mandibular ridge augmentation, including the modified lingual flap and the protection of the mental nerve during flap advancement; anterior maxillary ridge augmentation, including eight chapters devoted to the key steps in this process from papilla reconstruction of single tooth defects to papilla regeneration after vertical ridge augmentation in multiple missing teeth; a step-by-step description of severely resorbed complete maxillary reconstruction using guided bone regeneration (GBR) and simultaneous sinus augmentation, with a separate chapter on growth factor applications using BMP-2 and PDGF in conjunction with newly developed GBR perforated membranes; and complications of membrane exposure and the management of different degrees of graft infections. The user-friendly format is underscored by the unique "Lessons Learned" sections, which reflect on most of the cases described, making suggestions about what could have been done differently to achieve even better results. 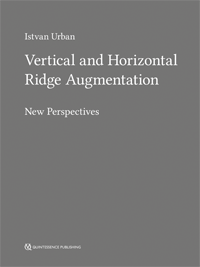 These sections contribute to making this book a useful and honest account of the clinical practice of ridge augmentation with GBR.